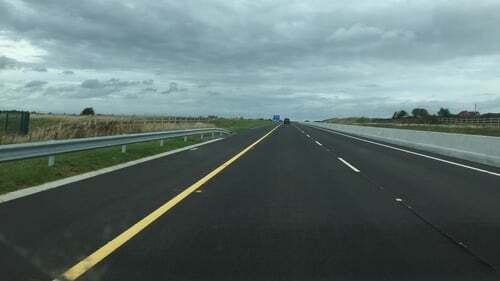 A new motorway between Gort and Tuam in Co Galway has opened. The M17/M18 runs over 57km and has cost almost half a billion euro to complete. It is expected to significantly reduce journey times to and from the northwest, by bypassing several traffic bottlenecks. The toll-free motorway has been constructed over several years, after almost a decade and a half of planning. For motorists going to and from the northwest, it will remove the need to travel through the previously congested towns and villages of Tuam, Claregalway and Clarinbridge. But there are concerns that problems common in those areas will be funnelled into Galway city, where gridlock on the eastern approaches is commonplace. For that reason, Transport Infrastructure Ireland and Galway County Council are describing today's opening as just a part of a wider plan to deal with increased volumes. The next phase will be the planned construction of a city bypass for Galway. But those proposals are already controversial in the areas likely to be affected and the development looks set to be challenged when it goes to the planning stage in the coming months.